As a young boy in Tucson, I grew up playing in the desert. My friends and I would spend hours building forts and clubhouses in the desert. Since it was hot, we naturally learned that if we dug into the ground and used shade, we could have a natural, cool environment. Also being quite interested in science, I read one day in Popular Science magazine about photovoltaic panels – invented by NASA, they produced electricity from sunlight. I found this remarkable. At the same time, I watched as the desert which I loved was rapidly destroyed by urban sprawl, and read the news about the effects of pollution on our environment in small and large scale. This concerned me greatly. So when I began thinking about architecture school, and realized that better building could make a big difference, the light went on! And it has been on ever since. 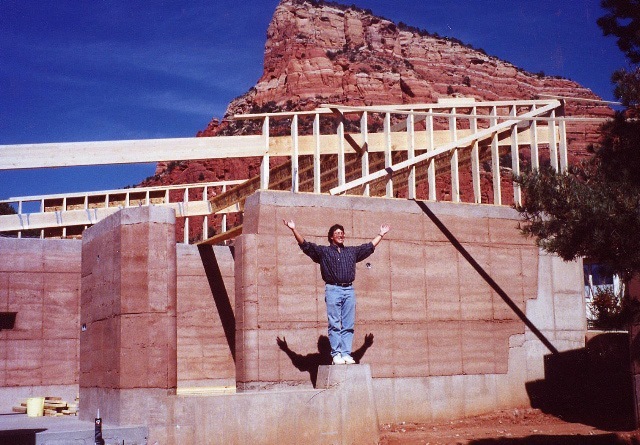 I went into architecture from the start to do environmentally responsible – what has come to be called ‘Green’ – design, initially wanting to do earth integrated or earth sheltered and solar design. In the years since, the world of building systems has expanded exponentially in the direction of green architecture and environmentally responsible building systems. These have been my tools and passion, and lead to new improved building and design solutions all the time. They can be applied in small part or comprehensively depending on what’s appropriate to the project and client, and there are always green components which can be used on any project of any size and any building type. Furthermore, not only are they increasingly becoming the best design solutions, but the possibilities and benefits of these systems – especially when combined for full-on green design – are undeniable. Furthermore, building codes are rapidly changing in a way that mandates efficiency in all aspects of building systems and materials. Each project is unique to the client’s needs. The goal of every project is to make the client more thrilled than they would have ever thought possible, both with the final project which they own and the effect that it has on their lives. I also take very seriously my responsibility to do the best building for the world in which we all live and share resources. Delightfully though, as mentioned above, the best systems are also the most exciting ones. As such, the client gets the best building, which has the least impact on the environment, and which I have the most fun designing. Green architecture provides scenarios in which everyone wins. My buildings are performance driven. I have designed buildings of all different ‘styles’, and enjoy variety. Rarely are any two of my buildings alike (though clients do often point out elements from previous of my projects which they like and wish to incorporate into their own projects). Buildings too are designed to fit their context and design criteria. Use of massing, texture, integration with the site, material, color and light – both daylight and lighting at night – are all key components of all of my work. And yet, how all this performs is the underlying goal with all buildings. And frankly, who doesn’t want to save money… The less one pays in utility and water bills, as well as future repairs, the more they can really enjoy the final result. Further, with current credits and rebates, the money one can get back for green systems (in addition to the lower bills) is a huge plus. My buildings, while they may appear complex to some, are designed with the building professional in mind. My projects are thoroughly thought through, in league with the contractors and engineering consultants on the project, so as to be as easy to build and as trouble-free in construction as possible. As I see it, the easier it is to build a project, the less chance there is for mistakes. The clearer the drawings, the better the experienced building professionals on the job can concentrate on what they do best, producing high quality construction. Moreover, if those building the project are happy doing it, it is my belief that that joy becomes part of the fabric of the building itself. I have worked in a host of green building systems, and have still more which I wish to build with but haven’t yet. I have built with Rastra, SIP (structural insulated panel) panels, rammed earth, ICF (insulated concrete form) systems, light gauge steel (virtually 100% recycled), insulated block and so forth. I have used photovoltaic systems for electricity, solar hot water for both domestic hot water and in-floor heating, as well as on-demand hot water heating. I have incorporated grey-water reuse in projects, dual flush toilets and waterless urinals, and have consultant availability for designing-in rainwater collection of both roof and site as well as integrated permaculture landscaping. And I have used bamboo and reclaimed wood floors, recycled glass tile, recycled material countertops, and the list of available ‘green’ finish materials is innumerable. And I have used energy saving lighting systems – including compact fluorescents since the first Cate Design project in 1989 – , power systems, and appliances for many years. 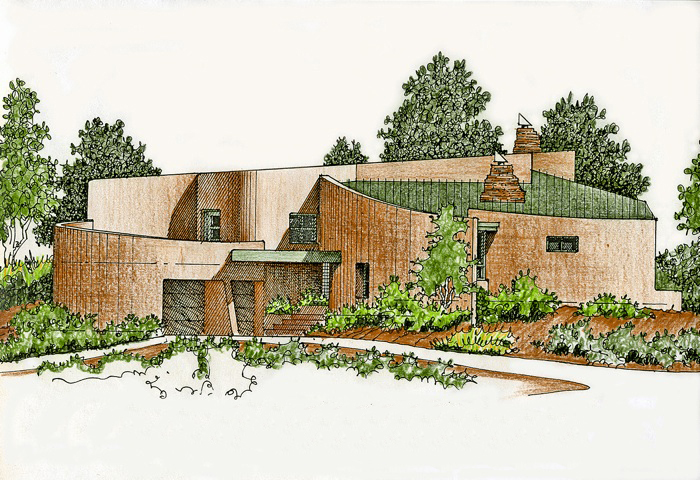 Two samples of green projects are the Mohney Residence (see articles in the Publications section of this website), and the recent Wharam Residence. Mohney Residence – This 3,700 square foot home has, in truth, around 5000 square feet of living space including the roof deck and patio. This home uses Rastra walls for the first floor exterior walls, SIP panels for the second floor exterior walls and thermal or sound partitions within the home, light gauge steel studs instead of wood for non-bearing interior walls, solar hot water for in-floor heat and domestic hot water, 10 kW of solar electric (photovoltaic) panels with battery storage, and grey water reuse. Wharam Residence – This project utilizes ‘Polysteel’ ICF exterior walls, I-joist roof with ‘Icynene’ insulation, insulated slab floor, ground source heat pump (aka geothermal) system for heating and air conditioning, and 3 kW of photovoltaic panels along with solar hot water. While these examples are single family residential, I can use and have used such systems on multifamily residential, institutional, and commercial work. I have participated in a wide array of building types, including single family, apartment, townhouse, condominium, subdivision/development, shopping center, industrial park, office, bank, physical therapy, hotel, bed and breakfast, school and so on. I am open to any size and type project for which a client truly feels they desire my architecture.